Specials - www.TheHomeInspector.com - The official website of Michael Leavitt & Co Inspections, Inc. www.TheHomeInspector.com - The official website of Michael Leavitt & Co Inspections, Inc. The cool crisp nights of fall have arrived and here are the latest Michael Leavitt & Co online specials. We know that you will absolutely love our home inspection services, and to reward you for your decision to use Michael Leavitt & Co Inspections you get to choose any of the following four ways to save. NOTE: Our online specials are a reward for our clients who order their inspection online. $150 RADON TEST - Order your home inspection online and type “RADON” in the“Online Coupons” box and we will include our 48-hour $185 RADON TEST for just $150. NOTE: Discount is good only for homes in Salt Lake and Utah Counties due to radon monitor pick-up travel expenses. $200 ELECTRICAL OUTLET EFFICIENCY TEST - Order your home inspection online and type “EOET” in the“Online Coupons” box and we will include our $360-plus ELECTRICAL OUTLET EFFICIENCY TEST for just $200 (Up to 2,000 Square Feet - Larger homes are more, but we will take $160 off the EOET fee). 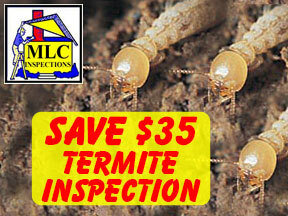 $150 TERMITE INSPECTION - Order your home inspection online and type “TERMITE” in the“Online Coupons” box and we will include our $185 TERMITE INSPECTION for $150 (Up to 5,000 Square Feet - Larger homes are more, but we will take $85 off the Termite Inspection fee). $235 METH HAZARD SCREEN TEST - Order your home inspection online and type “METH” in the“Online Coupons” box and we will include our $285 one composite 4 location sample METH HAZARD SCREEN TEST for just $235. NOTE: You may take advantage of 1, 2, 3, or all 4of these specials when you place your inspection order online.